We all know by now what dry shampoo is and how much of a lifesaver it can be when you just have not got the time to wash your hair, may it be you've slept past your alarm and your in a rush to be somewhere, or your just too lazy and don't like washing your hair everyday....I'm guilty of that one haha. But who's to say we need to spend a fortune on dry shampoo just because it's made by a well known brand?! It all or less does the same thing right, no matter what the name on the can says. I've tried plenty of dry shampoo's over the years and some of them have left my hair feeling worse than it was to begin with, which meant I was ending up having to wash my hair anyway just to get it back to normal. I then gave up on dry shampoo for a while and just went back to washing my hair most days unless I was having a day indoors then in that case I would just bung it up in a messy bun and forget about it. I then decided to try Wilkinson's own brand of dry shampoo's after seeing them on of there displays at the end of each aisle that they sometimes do instore to catch people's attention as they pass by. I was one of those that actually stopped to have a look at them aswell as the prices of it....bargain is all I can say! I myself have only tried the "all hair types" and the "volume" ones and I personally think they are brilliant, they leave your hair feeling really fresh aswell as looking clean. It's basically everything you would want in a dry shampoo. I now only need to wash my hair every 2-3 days as apparently washing your hair everyday can ruin it which I didn't know and my hair is thin enough as it is. 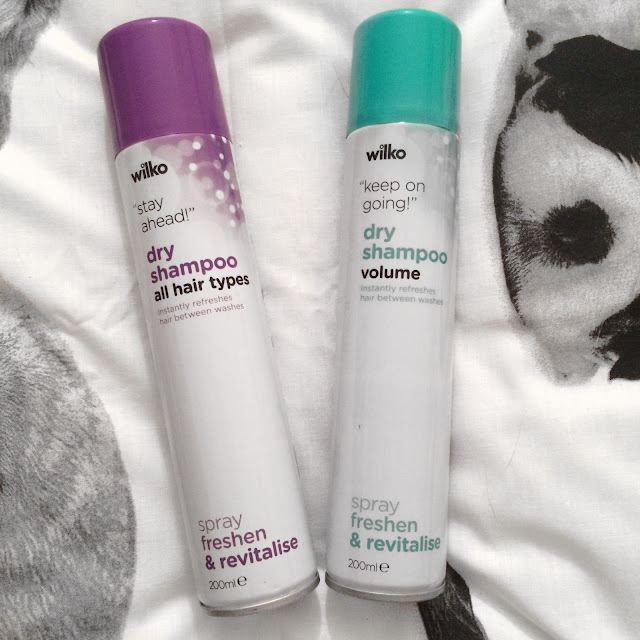 So next time you go to purchase your usual brand of dry shampoo, how about taking a trip to your local Wilkinson's and pick up one of these particular dry shampoo's and let me know what you think of them. *All opinions in this post are my own, I have not been paid or sponsored to do this blog post and products were purchased by me aswell.